The countdown has begun for the "12-Millionth Source Challenge" and Official Contest Rules have been sent out but the links to the online versions all appear broken. The Rules certainly look official with statements such as "These Rules form a binding legal agreement between you and FamilySearch with respect to the Challenge." Hmm. What if I have never read the Rules or even know about the Challenge and simply go about my work putting sources on the FamilySearch? Oh, Ho. And further more, in my blissful ignorance, I win the Challenge? Well, that wasn't covered in the Rules. Unless you were sent a copy of the Rules, I can't find them online, but I assume either that they have or will change the Rules or they simply haven't hit the Internet yet. I could say something about lawyers, but I won't. Hi, my names Eric Proffitt and I love family history! Recently my family just spent $1,200 hiring a professional genealogist to visit my wife's ancestral village in Ukraine and send us pictures. While the product was amazing and we were able to see our great, great, grandmas school, learn about cousins who are still alive, and got a feel for the culture of the area, the end result was really expensive. This got us to thinking: what if we could create a place where normal people like you and me could help each other find their families?? For instance, if I wanted a picture of my Keith Family Castle, but couldn't afford to fly to the Scotland, I could post my request and have someone who already lives there take the picture and send it to me for as little as $5! WOW! We need to raise $26,000 to pay the programmers to create the helpfindingfamily software which will allow millions of transactions between people doing family history and amateur genealogists. In exchange for your financial support, we have hooked up with local artists and genealogists to create some amazing rewards including: Free Family History Research, Family Crest Artwork, The Meaning of Your Family Surname Word Art, Family Tree Poster. It appears that this is not an "investment" but a gift, not to be confused with the current push to crowd-source investments for start-up companies. Without a whole lot more information about how this business will proceed forward, I certainly cannot endorse any such activity. Please make your own decision as to whether to contribute or not. It does remind me that we have had a similar organization for many years; Random Acts of Genealogical Kindness (RAOGK). In a Facebook post (27 Apr 2012), Doc indicated he was starting to restore the RAOGK site. For more explanation of the status see the FamilySearch.org Research Wiki article of the same name: Random Acts of Genealogical Kindness. A quick check of the status of the original RAOGK website shows that the domain is for sale, so the site must be inactive. I always advise caution in "donating" to any solicitation, especially any solicitation that you do not initiate. Be advised. I also told her that the only real way to make sure and find the records was to do a name-by-name search of the entire U.S. Census record for the place where the family lived in the 1920 U.S. Census since the family lived in the same place in both the 1910 and 1930 U.S. Censuses. We looked at the place (Enumeration District) in the 1920 U.S. Census and it had about 196 pages. I mentioned that I called this "bulldozing" the record, that is, starting with the first page and working my way back and forth through the record until I had searched every page. I also mentioned that inevitably, the name was always on the opposite end of the record from where you started (not always but it seems that way). She didn't say anything, but left to do her research. Yesterday, she came back to consult and was looking for someone else to talk to. She talked to Holly Hansen, who was sitting by me in the same room in the Library. She explained her question and Holly started to explain that she needed to look at the 1920 U.S. Census and go through every page of the place looking for the family. She said that was the same thing the I had told her the day before! We had a good laugh about that. Yes, the answer is always the same, go through the entire record looking carefully at every entry and make sure you look for variations in the spelling because the Enumerators did not necessarily spell the name the way you think they should have. Indexing is helpful, but not infallible. Even looking at multiple indexes is helpful, but again, if the Enumerator or whoever wrote the record got it wrong, the indexers will also "get it wrong" because they have no idea what the real name is but only what was written on the page. 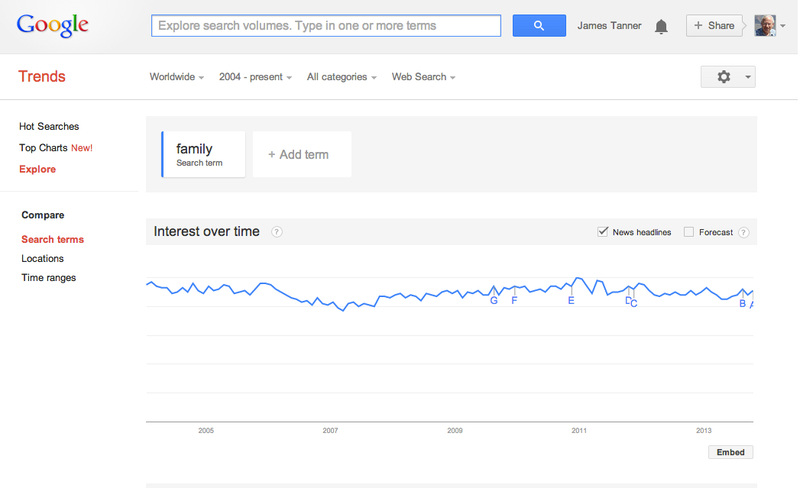 For example, "Tanner" has been indexed as "Tamer" and many other variations. If you look at FamilySearch.org and its millions upon millions of digitized records in the Historical Record Collections, you will almost immediately see that there are a huge number of unindexed records where the images are available and the only option is to bulldoze through the records. Fortunately, the records are broken down into separate microfilm rolls, so the research is much less difficult than it would be looking at the original microfilms, but it is still tedious in many cases and takes considerable time to go through each section of the records. One of the researchers was complaining that the exact microfilm record in the Library that she needed seemed to be missing. There was no "space" where the record should be. It was gone. I explained that as the records were digitized online, they were retired from circulation as microfilm rolls. This likely solved the problem of the missing roll since I have not yet heard back about the issue. If you think about this for a few seconds, would you rather sit in front of your own computer and examine the digitized record with the ability to zoom in and magnify the image or sit in the dark at the microfilm reader with its limited ability to enhance the image? The advantage of digitized images is apparent, but the availability of the images does not do away with the need to bulldoze through every page of some types of records, even if the records are indexed. How badly do you want to find your missing relatives? It takes only a few sessions of research to realize that you do not always find them easily in some online index. Just hope they lived in a small town. Holly related to the researcher yesterday how she bulldozed through the entire Salt Lake City, Utah U.S. Census record for one year and finally found her ancestor. So, read (bulldoze) the entire record. It may be the only way you find what you are looking for. Perspectives on Personal Digital Archiving, National Digital Information Infrastructure and Preservation Program, Library of Congress 2013. Imagine someone 50 years from now who wishes to study our life in the early twenty-first century. Getting any kind of reasonable understanding will require using born-digital sources: websites, email, digital photographs and a host of other material that exist only in electronic form. This means we have to preserve lots of digital information for a long time. Doing this work is, however, fundamentally different that preserving books, papers and other traditional forms of information. Digital content can be hard to capture, difficult to organize and use and prone to going obsolete due to changing technology. The Library of Congress is attending to its digital holdings to ensure that they remain available over time. This is a critical responsibility for a collecting organization, and requires a good deal of careful planning and attention. Acting now, and continuing to act tomorrow, is essential if digital materials are to carry memories into the future. We all needed something exactly like this to give us the parameters of the official standards for preservation. This gives me and all of us a place to go to to see the position of the Library of Congress about this important subject. MyHeritage.com has announced that they have added millions of gravestone records and obituaries to SuperSearch, their online search engine for billions of historical records. This new addition includes 5.5 million gravestone records from BillionGraves.com and 3.5 million obituaries from Tributes.com. And new 5.5 million headstone records from BillionGraves. With nearly 6 million headstone records created by over 57,000 volunteers in just two short years, BillionGraves is the trusted resource for accurate and reliable GPS headstone and burial record data on the web. With users in more than 212 different countries, the website is available in over 3 different languages. Over 12 thousand records are added each day to the BillionGraves network and 4 thousand new registered users join every month. BillionGraves’ mobile GPS tracking technology on their mobile application perpetuates this progress, bringing a wealth of genealogical information right to your fingertips. From my perspective, all of these agreements between the various companies simply makes the records more available to more genealogists. There are a number of significant additions to the FamilySearch.org Photos and Stories program. This seems to be the most rapidly changing part of FamilySearch.org lately. The changes include the following items. I have included some of the wording from the blog post to make sure I reflect the intent of the release. You will see that wording in quotes. When it was rolled out, Photos allowed a maximum of a 5MB file. It usually takes some file reduction to meet that limit. The new file size maximum is 15MBs which is a significant size increase and will include many more files without alteration. This increase really doesn't affect those of us storing our files as Camera RAW, DNG or TIFF files, we will still have convert them to smaller files and to JPG format. But those photos I already have as JPG files will now be able to be uploaded without conversion, especially those taken with a smartphone such as my iPhone 5. I have no interest in putting photos of living people into FamilySearch.org or any other program, but "you can now link photos and stories to living people in Family Tree. As long as you have the rights to see that living person in Family Tree, you will also see the photos and stories linked to that person." That means if you do not have the rights to see that living person, you will not see the photos. I have already commented on this new development. From the reaction I am getting from the community, I think that most people do not understand the importance of being able to include your own documents in Family Tree. This has been one of the most asked questions in past as to when this feature would be added. Well, it is now available. You can upload your scanned images of family documents and records. 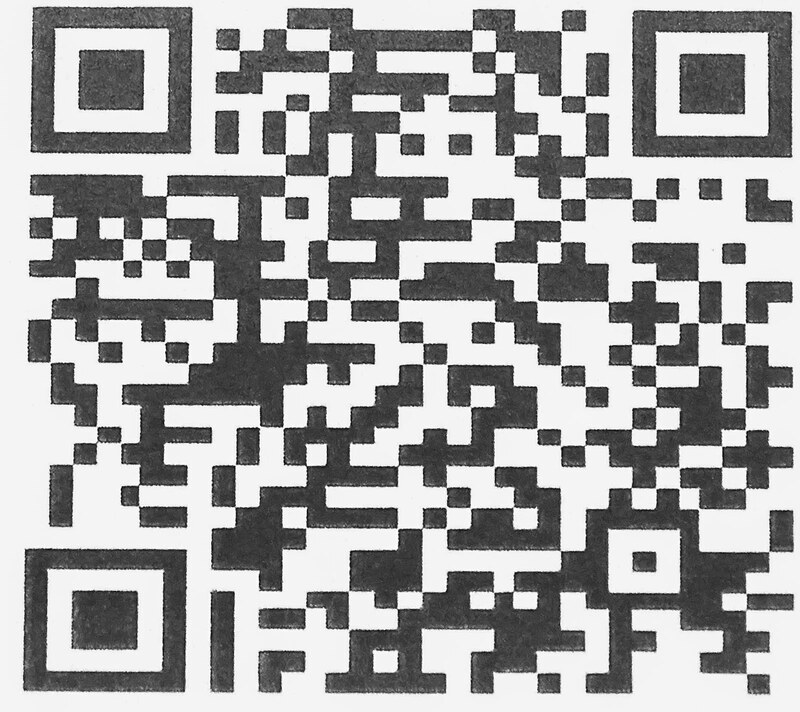 The blog post includes detailed instructions about how to upload and include scanned images. If you use the beta picture viewer (discussed next) you can change photos to documents or documents to photos. This is useful if you have uploaded scanned documents as photos and now want them to appear as documents. In other words, you do not have to delete a scanned document from your photos folders and upload it again as a document. Click the item you want to change. Click View photo in BETA viewer. I have noticed this viewer lately and it does give a big advantage over the old one because you can see the photos in a full screen view. I will have to spend some time with this feature and then will do a video explaining all the options for both photos and documents. For now, see the instructions included in the blog post. As I mentioned in the beginning, some of these new changes are significant. The ability to add in your own scanned documents in PDF format is something we have been waiting for. Every once and while it is a good idea to step back and take stock of where we are and where we are going. This applies to pursuits such as genealogy as much as it does to everything from governments to individuals. So where are we today in our genealogical community? I have heard some comments lately that raise some important issues. For example, some of the more common comments center around the speed of technological change and the individual's inability to cope with all of the changes. Frequently, I get calls and requests from friends, blog readers, patrons at the Mesa FamilySearch Library and some relatives for help with understanding and using some new technology from genealogy programs to tablets and iPads. I had someone hand me an iPad yesterday and ask for help. Are those of us swimming in the main part of the stream really aware how fast the stream is moving? Right now, I am facing an upgrade to the Apple operating system. The latest system is called OS X 10.9 Maverick. At least they got away from cats. But the problem is that some of the basic programs I use on my computers have to be upgraded even before I upgrade the system. How are we supposed to know this? Do I just go ahead and upgrade my system software and hope for the best? Yeah. But do I really want to spend almost an entire day doing nothing more than watching the computer load software? I am not getting paid by Apple or Microsoft or Google to watch beach balls. I already sit there and feel frustrated almost every time I shut down my Windows based computer and have to wait for 1 of 23 upgrades before I can shut down and all the time looking at the dire warning from Microsoft that my world, as I know it, will end if I shut down my computer prematurely. If I am frustrated and challenged by upgrades after the thousands (tens of thousands) of upgrades I have loaded over the years, then how much more challenged are those who don't even understand what is going on and resent the cost and time involved? Think about it, this is only one tiny part of the technology issues we have inherited as genealogists. Remember, I did not have to upgrade my pencil, I just had to sharpen it and replace it from time to time. That was not very frustrating or difficult. Thinking about that, I haven't used pencils much for a long time. I used to have a rather prominent callus on my finger from using a pencil and I just checked at it is gone. But now my fingerprints are almost worn off from typing. We were at the Family History Library yesterday and when I entered and went to the elevator, I was confronted by a a virtual army of people in matching shirts who were all apparently technologists. It turned out that there had been one of the "regular" system upgrades to the computers that take place on Sunday and as a result almost all of the computers in the Family History Library were inoperable. Hundreds of people coming into the Library to do research and they can't even access the catalog. Hmm. I don't recall this ever happening with the old card catalog. Anyway, at the end of the day, there were still many of the computers that were inoperable. Whether we like it or not, we are at the mercy of the technologists. My own challenge in this regard comes from losing WiFi and Internet service as I travel around the country. When I was in Nauvoo, Illinois, it was extremely difficult to find a signal to use my devices. What about the people who live there? I certainly feel sympathy for all those of us who feel like the cost of access to millions and billions of source documents is very high and causes a great deal of trouble and anxiety. Is looking in online databases "real" research? I was recently told that doing my research, via Ancestry.com, was not doing research or real genealogy/family history. If it weren't for what I find on Ancestry.com, the documents, census' and other things, without the help of the trees which I use only for possible hidden/lost children, I wouldn't be able to do anything. I am home bound, cannot get away from the house for very long, therefore going to the FHC and off to SLC or other places is virtually impossible for me. It appears to me that whoever made this statement to you has no idea what they are talking about. I have gotten some very valuable documents from Ancestry.com and many other similar online sources. If I obtain a copy of the U.S. Census from Ancestry.com, MyHeritage.com, FamilySearch.org, Archive.org, HeritageQuestOnline.com, censusrecords.com or some other website while I am sitting at my computer at home, why would that make them any less or more valuable than doing the exact same search on a computer in the Family History Library in Salt Lake City, Utah? The person that made that comment doesn't actually believe that we look at the paper documents when the copies are online? If they do, they must be woefully unfamiliar with how genealogy is done in the 21st Century. When I first started to become involved in genealogy, I went to the Family History Library and was told to look at the U.S. Census records. At that time, they were all on microfilm and I soon determined that many of them were entirely unreadable. As a result, until the microfilms were digitized, I never really used the U.S. Census much. The only thing I would recommend to the commentator is to broaden his or her online search efforts and use some of the many, many other fantastically valuable websites. I would suggest using the FamilySearch.org Research Wiki for a good place to find links to other valuable online records. I would also suggest that he or she may wish to give a copy of this post to the "friend" who gave the advice. The simple answer to the question posed in the title to this post is yes, looking at digitized copies of original documents online is real research. I decided to try the alternative term of choice of many in the community, "Family History." The decline is equally dramatic. I tried the same thing with "FamilySearch." Once again a dramatic decline. Branching out a little I tried "Ancestry." 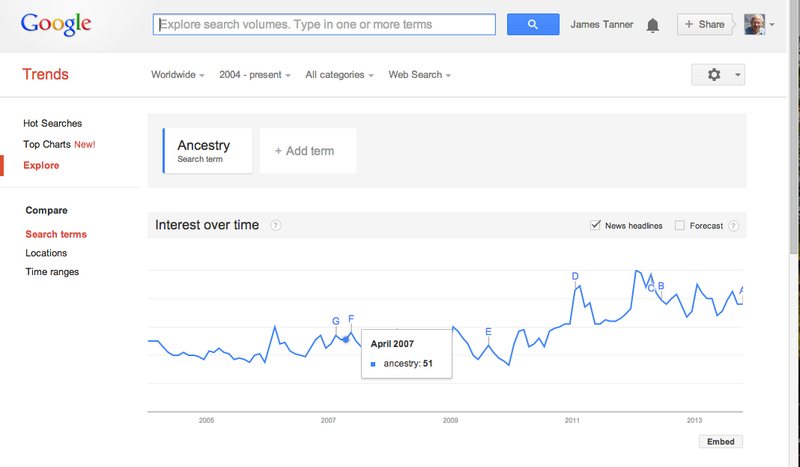 This is a broad term and it is unlikely that all those searches had anything at all to do with genealogy. 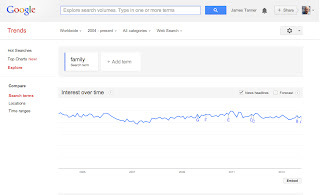 That definitely reversed the trend but I decided to see what happened with the word "family" all by itself. 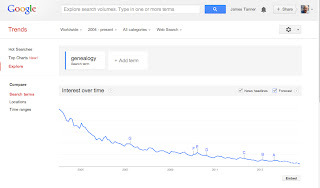 This is a rather constant flat line, so there must be something going on in the genealogical community. 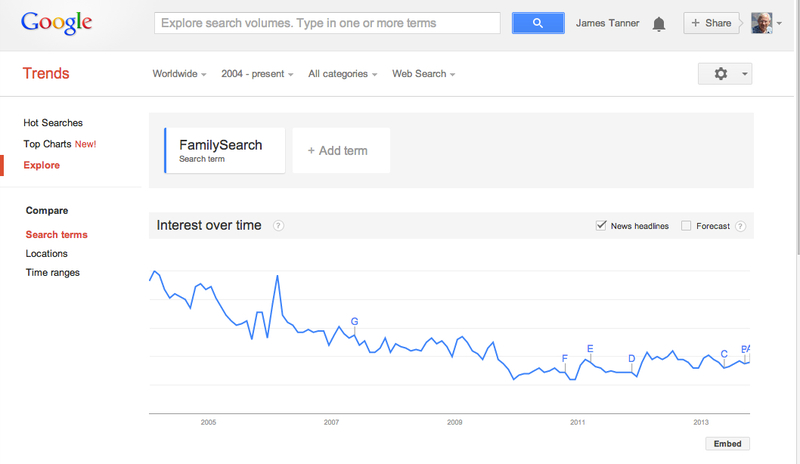 Why are we losing the search terms wars? 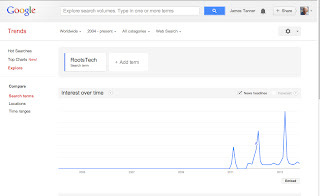 But if I try something such as "RootsTech" you can see that that the trends match the times when there is increased interest. It looks to me that only Ancestry.com with its mega- advertising campaign has been increasing in popularity. Almost every other term I could think of, including the names of some software programs showed similar declines. Just a short note to tell anyone who might be in the area, I am sitting all this week doing research and helping others with their research at a Family History Expos Retreat in the Family History Library. I will like be on the 2nd floor and it looks like we will be camped out in the are to the east side of the main area where the microforms and readers are kept. I will be at a table with electrical outlets. I may be consulting with one of the people attending the Retreat, but feel free to say hello and come back and talk. About a month ago, I started yet another blog. This particular blog is called "Rejoice, and be exceeding glad..." I decided to open this new venue to be more specifically aimed at the genealogy experience and community of those who belong to The Church of Jesus Christ of Latter-day Saints. I have always tried to make Genealogy's Star as inclusive as possible and for that reason have passed up comments I might have made that pertained to the particular experiences of members of the Church. The new blog is not exclusive in any way, but it is more directly aimed at the LDS genealogical experience. In its context, I will try to appropriately comment on those portions of FamilySearch.org and other LDS resources that are available to and mostly used by Church members. In addition, I will try to stay away from topics that might be better covered in my general community blog, Genealogy's Star. There are quite a number of posts already on the blog, so you are welcome to browse back through the back posts. I am certain, as is inevitable, that my content and perspective will change over time, but you will get a flavor of the things to come. Thanks for reading Genealogy's Star. Mann, Thomas. The Oxford Guide to Library Research. New York: Oxford University Press, 2005. I don't recall ever having any formal training about how to do research, but I started learning about the subject many years ago while in high school. As I continued my studies at the University of Utah, I gained a number of additional insights into the research process. I have recently written a couple of posts on the subject, but I keep getting more insights and decided it was an important subject and key to advancing in our own quest to learn about our ancestors' history. The most efficient way to do library research is to match your retrieval technique to the library's storage technique, for in this way you will be exploiting the internal structure of the system. (emphasis in original). The idea here is that knowledge of the library's internal structure is an important key to retrieving information. This concept does not just apply to libraries however, it is also key to finding information online. Unfortunately, this particular edition of this book was published back in 2005, years ago in the online world and practically ancient history, but the concepts apply even if the author's views on searching online are woefully outdated. I have always been puzzled why so many people come to me and complain that they can never find what they are looking for online. On a recent Skype message concerning the FamilySearch Research Wiki, one of the participants asked a rather simple question that she could not answer. I looked up the answer and got a comment back a few minutes later wondering how I could find the information so quickly. My thought on the comment was why she couldn't do the same thing in the same amount of time? Research is skill. I have learned that there is a huge difference between watching someone do something and trying to do it yourself. You can sit on the shore and watch people swim all day, but until you get in the water and start swimming none of the examples mean anything at all. It is same with research. But unfortunately, you don't get to watch others do research very often. You can learn by trial and error, like I did, or you can learn the principles and try to apply them by practicing. Most of the instruction on how to do research focuses on the Research Cycle or similar types of training. What is missing from this type of instruction is a basic understanding of internal structure of the library, the Internet or archive or repository or whatever the location of the information to be researched. One thing I have said many times in the past is that to be able to do research on the Web you need to understand how programmers think. What I mean by that statement is that you need to understand what happens when you type a search term into a search engine and why getting a million or more results is irrelevant to your search. The number of results reflects a lack of focus. It is fairly easy to search for something and get no results whatsoever, even when you are using Google. To illustrate this, try searching for a single word, such as genealogy, for example. I just searched on the word genealogy and got 313 million responses. This is entirely useless. Why is that the case? For one thing, the word genealogy is used in a lot of different contexts other than our use of the term for family history. In fact, this general search on Google brought up paid-for advertisements from online genealogical database programs such as Ancestry.com. If you were really trying to find a general idea of what genealogy is all about, then you might be quite frustrated. But there is a simple way, if you know how Google works, to get started with an understanding of genealogy. Change your search for the word "genealogy" to search for "define genealogy." This simple change makes a world of difference in the results of your search and there were no ads. It also illustrates the internal structure of the Web and how it operates. Now things get complex and that is the real problem with learning how to do research in any context. It is not a simple task. Research is a challenging, yet very rewarding pursuit. In some subsequent posts I will continue to explore the inner workings of research. Stay tuned. Do you understand how FamilySearch Family Tree works? I had a rather long and involved comment to my last post. I am not quite sure what I said that elicited the comment, but there were several points that I think need responses. I will try to extract the points made in the comment (with a few small corrections for spelling etc.) and add my own comments. Comment #1: I am not all that enthused about Family Search and the new "editing" ability for everyone. For instance, I was trying to merge a name, "Cordelia Hocker" and ended up deleting the one that had the most information. Well, this is a pretty easy one to respond to, but not so easy to resolve. Merging and deleting are not the same thing. When you merge two records in FamilySearch.org Family Tree, you get to choose which variation of each event is preserved in the final copy. This function works essentially the same as every other genealogical database program with merge feature you can purchase today. It is actually simpler than the merge function in Personal Ancestral File. When you merge two individuals, one disappears and one remains. You need to carefully review each item on the compared pages to see which ones you want to remain and which ones disappear with the merged individual's record. If you accidentally merge the wrong people, you can reverse the merge. When you delete an individual from Family Tree there is no opportunity to preserve any of the information at all from the deleted individual, unless you copy it before you delete. Everything pertaining to the deleted person is gone from the file. There are rather prominent warning messages explaining the results of deleting and cautioning the user to only use the delete function as a last resort. You can restore a person whose record has been deleted from the system. 1. Open the details page of the deleted person’s father, mother, spouse, or child. Important: The details page that you open must be for a deceased person. To restore a deleted person, you use the change history, and the change history is not available for living people. 2. In the Latest Changes box, click Show all. The person’s change history appears. 3. In the change history, find the entry that indicates that the relationship to the deleted person was deleted. If the change history contains more changes than can be shown on the list, click the More link that is found at the bottom of the list. Tip: If the change history is long, scan the right side of the change history, and look only at the entries that contain a Reference link. All deleted relationships have a Reference link. This is often faster than looking at each entry individually. You can also use your browser’s Find feature to search for the word “Deleted” or name of the person that you want to restore. In most browsers, press Ctrl+F to use the Find feature. 4. Click the entry’s Reference link. The deleted relationship appears. b. Enter a reason that explains why this person and relationship should be restored. Comment #2: Also I am not thrilled with the being able to make changes anyway, whether I goofed or not. I don't think this person meant what they said. If there is wrong information in the Family Tree program, the whole idea of the program is that the wrong information can be corrected i.e. changed. Comment #3: People have way to much wrong information due to that lack of good research documentation. "Our family says: so and so was born **** and the other person is wrong" is not my idea of correcting information. One of the major advantages of FamilySearch Family Tree is to correct and document with sources the years of misinformation that have been passed down in families. The idea of the program is not just to say something is wrong, but to provide reliable, documented sources. Comment #4: Also, I placed my family tree on there some years ago, I have since done more research and the tree has been added to and/or changed from what is on there. I am not sure exactly why this is a problem. 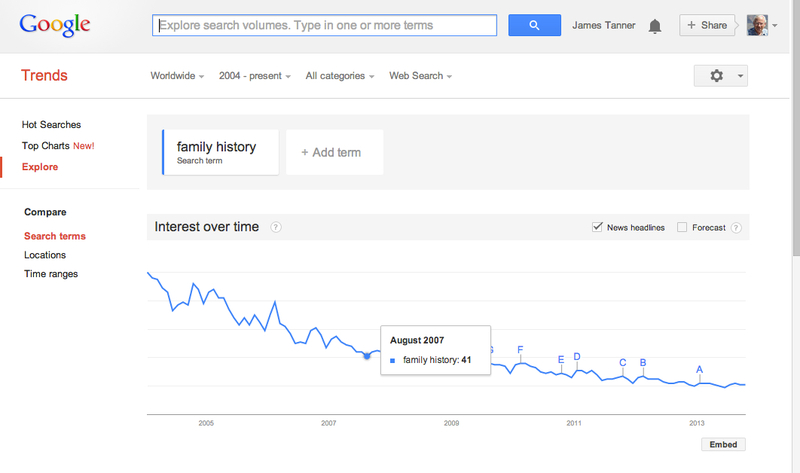 But the fundamental issue here is that FamilySearch Family Tree is not owned by anyone. It is not your family tree, it is The Family Tree. You do not own your ancestors (the 13th Amendment to the U.S. Constitution did away with that). You should welcome the changes is they are sourced and accurate. If they are not, then you can change the entries to reflect the correct information. Comment #5: Documentation also is with the information/names. How do I go about placing this information on the site? When I got to this point of the comment, I began to doubt that this person has even looked at Family Tree yet. But perhaps she needs some very basic instruction in editing entries and adding sources. I suggest a class on the subject or watching a video. Here is a link to the video on Adding Sources. Comment #6: Will the old tree be deleted and the new one will be made available or will it just be added to all the other "stuff" that people have put on there? I thought this might be a reference to New.FamilySearch.org, but upon re-reading the comment, I am not quite sure. In any event, New.FamilySearch.org goes away and the information from that program has already been made available to the Family Tree program. Comment #7: I am unable to go to the FHC and get this worked out as I am a stay at home person most of the time due to health issues. Therefore I cannot get help in that regard. I suggest clicking on the link in the upper right-hand corner of the FamilySearch.org startup screen for "Get Help." You do not need to go to a FamilySearch Center to get help. There are many volunteers that will help you in your home. You can use the telephone support and online support. There are dozens of video, webinars, webcasts and other resources to teach Family Tree as long as you have an Internet connection, which this person apparently has from the comment. What Happened to the Guide to FamilySearch Online? 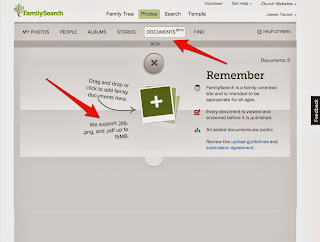 Two years ago in mid-2011, I published The Guide to FamilySearch Online. 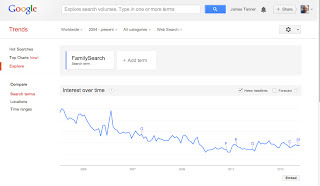 (Tanner, James L. The Guide to FamilySearch Online. Mesa, Ariz: Bookmark Graphics, 2011). The question has been asked many times if there will be an updated edition? This has been a serious concern of mine for the last year or so. 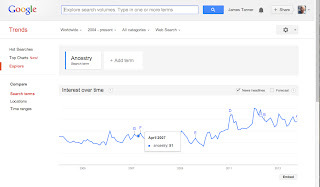 In March of 2012, FamilySearch announced the FamilySearch.org Family Tree program. At the time there were nearly constant indeterminate predictions of the demise of the program it replaced, New.FamilySearch.org. Quite frankly, I kept waiting for Family Tree to settle down and to be separated from New.FamilySearch.org. As long as the two programs shared the same database there were several key features of Family Tree that did not operate correctly. 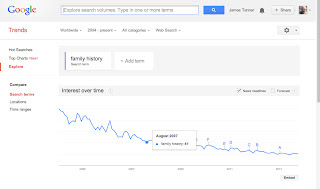 As the time dragged on for the separation, FamilySearch has kept up a steady stream of modifications to both the Family Tree program and FamilySearch.org. A year before the site was revamped, I was demoed a potential startup screen. All of these factors led me to wait "just one more month" for an update. I did not want to publish an updated book that would be out-of-date the day it reached publication. 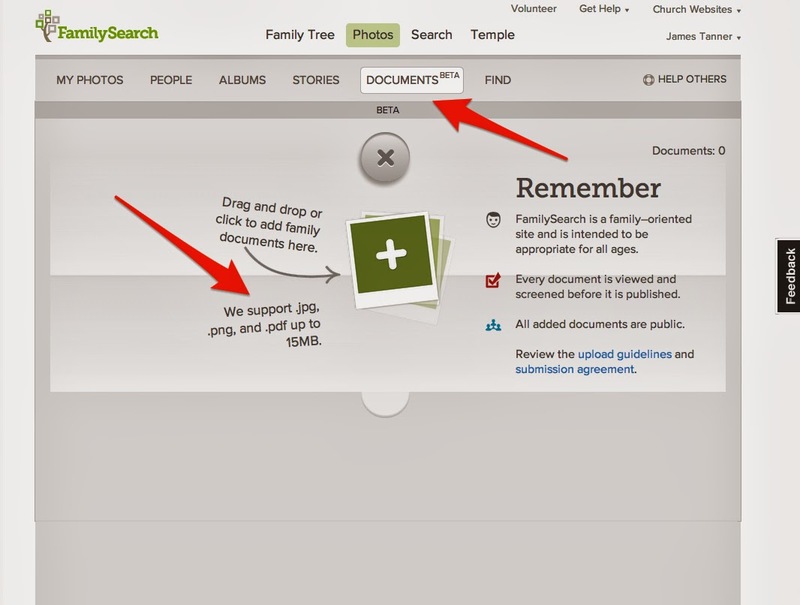 Presently, it looks like the New.FamilySearch.org program may become separated from the Family Tree program at the end of 2013. Regardless of any remaining changes or updates to the Family Tree program, I will likely do a complete revision and a new edition of the book in 2014. Another consideration was whether to publish the book in both paper and digital versions or only digital? I will work out all these issues as I see how FamilySearch.org progresses. As I review the book, I find that most of the changes to FamilySearch.org are either superficial of cosmetic. Most of the existing book, especially those portions of the book dealing with other websites and the basic functions of the program are valid if only slightly out of date. Granted, there have been enough substantial changes to the content to necessitate a revision. A commentator posed a recurring question about media links in the various genealogical database programs. Anytime the database is moved from one device to another, the link between the media file and the program is lost. These lost links are handled in a variety of ways by the different programs, with some doing a better job than others. The issue arises when you crate a link from an individual or event listed in your database program and an external photo, document or video or audio recording. I am not aware of any of the programs that make a copy of the media item and incorporate it into the program. At best, the programs make a thumbnail or small reproduction of the item for inclusion. The program then records the path to where the actual item is stored on your computer. I have tried to solve this issue by storing all of the images for all of my programs in one huge file folder on my computer. That way, I can link to the items in that folder and as long as I copy the folder to the new device, my problem of maintaining a link to the files is solved. In my case that file does not hold all of the media items, only those that I have already attached to one of my programs. As that file grows, I will likely have to come up with some alternative storage strategies. What if you cannot find the photo or image of the document on your computer? I suggest downloading a copy of Google's Picasa. Once downloaded, Picasa will inventory every image on your computer. The images will not be moved and no copy is made by Google. But you will be able to use the programs editor to edit the images and move, rename and delete the images. You may want to check the options or preferences for your genealogical database program. Usually, the programs allow you to designate the preferred folder for your documents and other media items. I always try to use one folder, as I said, for all my programs so this is pretty easy to figure out. You might become aware that almost every program has extensive instructions about what to do with broken links. Most of the online resources are program specific. So do a search for broken links and add the name of your software program. 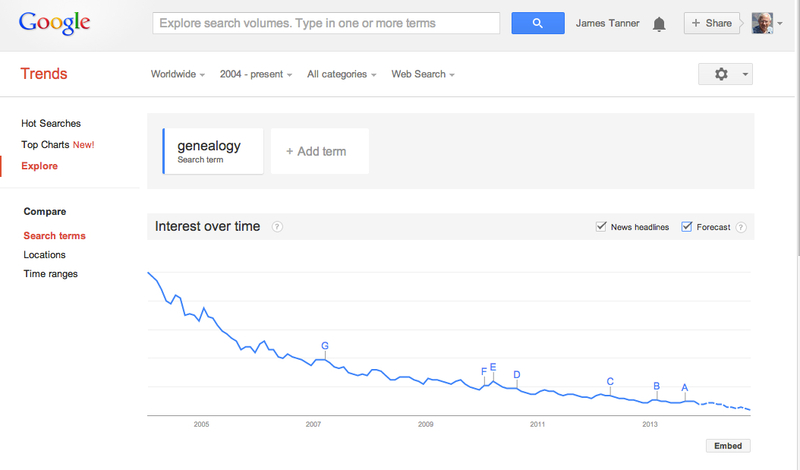 What are the most popular genealogical websites? About.com Genealogy had a short article by Kimberly Powell on the "Most Popular Genealogy Websites 2013." They listed the usual four large online genealogical database/family tree programs, Ancestry.com, MyHeritage.com, findmypast.com and FamilySearch.org, but also added in FindAGrave.com. It should be noted that FindAGrave.com is now owned by Ancestry.com. Each of these four entities have multiple websites so the question is whether you consider only the main website or add the traffic from all the owned sites? If you base "ranking" on a website such as Alexa.com (which I have done in the past) then it is difficult to factor in the multiple websites own or operated by the parent entity. In doing this comparison, I struggle with the terminology. FamilySearch.org is a non-profit and does not technically compete with any of the other entities. The other large companies have multiple websites, some of which are more or less autonomous. For example, it has been reported that Ancestry.com has owned Archives.com for some time now, but the website still does not reflect any connection with Ancestry.com. A quick check with Alexa.com shows Ancestry.com today at 584 in the global ranks and 176 in the U.S. No other genealogy company is even close to this ranking. But at the same time, Archives.com is ranked 11,663 in the world and 2,476 in the U.S. In looking at MyHeritage.com today, it is ranked 5,405 in the World and 3,062 in the U.S. Putting it ahead of Archives.com in the World and behind in the U.S. Do we discount Archives.com simply because it is owned by Ancestry.com? Then why include FindAGrave.com? In this list there is no number five because all the rest of the list are owned by someone else. For example, MyHeritage.com owns WorldVitalRecords.com and Geni.com. Where is findmypast.co.uk? Well, if you take all the D.C. Thompson Family History websites together, they would likely rank very high, but individually, there are more popular websites. Ranking the top ten or whatever of the genealogy companies is much harder than you might think and the lists are almost always wrong, probably mine also. Any site in the top 100,000 of the World and in the top 50,000 in the U.S. is extraordinarily popular. If you want to get some perspective, you could look at this blog's ranking today, 346,691 in the World and 59,692 in the U.S. Not high enough to be on anyone's radar for a long time. Making Further Inroads -- What do I mean? "I am not presently in a position, absent a workable online program, to make any further inroads into my ancestors." I'm not sure what you mean by that. I'm sure that many many folks (almost all?) rely a lot on secondary sources -- unless they are a professional-quality genealogist. My comment was admittedly obscure. My reference was to the present condition of the FamilySearch.org Family Tree program. The data in the program is chock full of duplicates, especially among my ancestors. Because the program is still using the same database as New.FamilySearch.org, there are limits on the ability of the users to eliminate duplicate entries. So, until that particular issue is resolved, I am prevented from correcting the information in the file and making further progress online. The work that I do takes place in my local programs on my computer. I am waiting for FamilySearch Family Tree to be "fixed" so that I can enter the information I already have into that program. Why Family Tree? Simple. I happen to think that it will ultimately work better than any other present option. One of the challenges of genealogical research is trying to reconcile family traditions, passed down through stories, with the historical facts uncovered in the process. Sometimes the stories are verified and sometimes not. My daughter Amy posted an excellent example of the process with a conclusion as to the veracity of the story on The Keepapitchinin Blog in a post entitled "Eminent Women: Caroline Blake Hardy." The story was quite detailed and contained some very uncomplimentary details about the subject's life. Both fortunately and unfortunately, the facts were quite different than the tradition. Neither were very positive, but the tradition, believed for many years, was less flattering than reality. This is often the case. As stories are passed down, they take on a life of their own and become the "new" reality. The documented history is usually more complicated and, if anything, more mundane than the traditional story. It has been my position for years, both as an attorney and as a genealogical researcher, to doubt most of what I am told by my clients, the opposing parties and their attorney. The reality usually lies somewhere in between all the different versions of the "facts." Sometimes, it is easier to believe the client and proceed, but that course always has a element of danger. The danger lies in being too believing until all of the facts have been discovered. After years of experience, I got a lot better at detecting unsupported facts. That made my life a lot more difficult because of the number of cases I had to turn down. My own ancestral family has some pretty well codified stories. It would be easier to believe the stories and let the story control the present. But I cannot do that. Could my opinion be wrong the story be right? The issue here is that the stories seldom have source citations. Some of the conjectures in the stories cannot possibly be true, given even a modicum of factual investigation. In some cases, the entire story is speculation or fabrication and research fails to reveal any relevant facts. Amy has carefully documented her version of the story. So what actually happened is much more likely closer to her interpretation than the traditional story. I think that most investigations end up in a similar manner, if the researcher is careful, insightful and meticulous. The Digital Public Library of America (DPLA) continues to rapidly expand both the size of its collections and the scope of its technology. In expanding its collections, the DPLA Welcomes Three New Service Hubs to its Growing Collections: New York, North Carolina, Texas. The three new Service Hubs – Empire State Digital Network (New York), The Portal to Texas History (Texas), and the North Carolina Digital Heritage Center (North Carolina) – will bring hundreds of thousands of new digital materials into the DPLA collections. 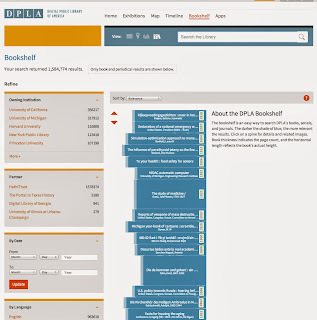 The DPLA Service Hubs are state or regional digital libraries that aggregate information about digital objects from libraries, archives, museums, and other cultural heritage institutions within their given state or region. Each Service Hub offers its state or regional partners a full menu of standardized digital services, including digitization, metadata, data aggregation and storage services, as well as locally hosted community outreach programs, bringing users in contact with digital content of local relevance. 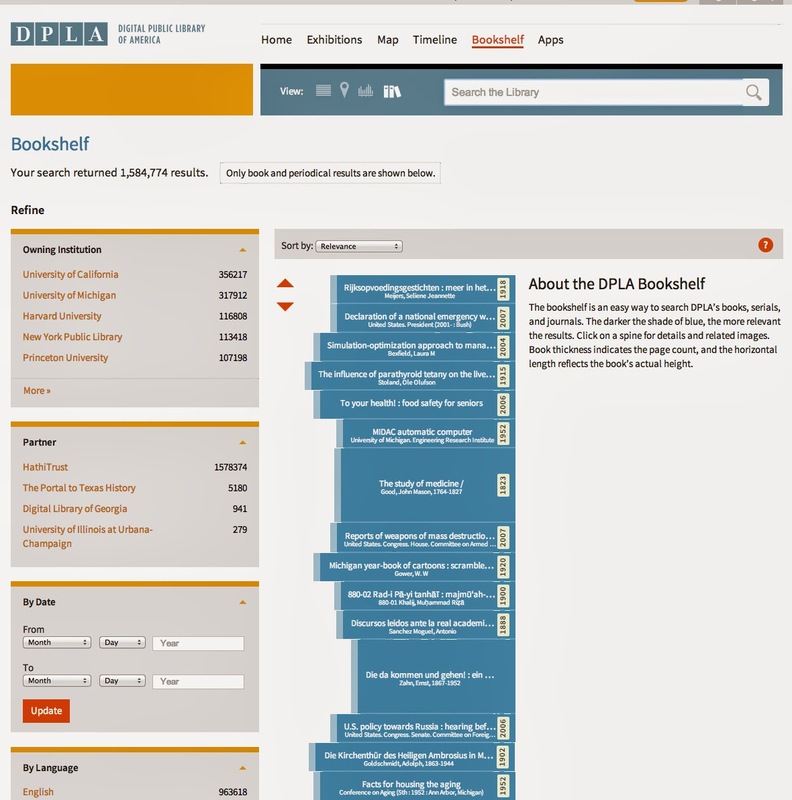 For a more complete explanation of the content of the three major additions, please read the DPLA blog post. This is an attempt to overcome one of the most common complaints about searching on the computer, the lack of context with other books on the same subject. I guess I can get used to searching vertically rather than horizontally, since I used to get a cricked neck trying to read the titles on a horizontal shelf. Genealogists, especially those starting out, seem obsessed with U.S. Census records. It usually takes a new researcher some time to get over this obsession and move on to other records. But what I have always found interesting is although everyone seems to look for census records very early, few people use the records to suggest other areas of inquiry and research. In a class this week, I showed the participants a U.S. Census record and merely went across the various fields talking about the information. All of the participants seemed utterly amazed at the wealth of information, but on the other hand, not one of them could have suggested where to go next. Google's video is quite misleading. The U.S. Census has never counted every person in the country. But the idea of using the U.S. Census records to get a "snapshot" of the country is a good idea for genealogists, although a little more in depth than the video would have you believe. How many genealogists have ever looked at the U.S. Census Bureau's website in depth? The website is easy to remember. It is "census.gov" just like the Library of Congress is loc.gov. The website is very much slanted towards the currently available census data from the last few census records. But if you dig into the website, you can find the material dating back to the original U.S. Census in 1790. For example, there are pages with an overview of each of the censuses. See the 1790 Overview. The U.S. Census website even has a specific section for Genealogy. The site includes the lists of questions for every U.S. Census, a list of all the State Censuses, references to other genealogical sources, and much, much more. I suggest you start clicking around on the U.S. Census Bureau website. You might find something surprising, such as all the Enumeration District Maps. If you don't know the importance of these maps, perhaps you need to know a little more about the value of these and other records to genealogists. In my first post on this topic, I think I sufficiently distanced myself from the vast majority of genealogists and probably left a few wondering what I was talking about. The point of my first post was simple; the issue of duplicate family tree submissions has been around for a long time. I was more than used to dealing with duplicate entries that disagreed about everything from the spelling of the ancestor's name to the number and names of children. The process I went through to sort out all this conflicting data took years. Little did I know at the time that I was seeing only the barest minimum of what would become a major genealogical issue. The procedures and methodology I used more than 30 years ago still apply today to the proliferation of online family trees although the magnitude of the problem has increased dramatically. Just one example, I searched on Ancestry.com for one of my New England ancestors, Phillip Taber (b. 1646, d. 1693). There is also a common alternate spelling of the name as "Tabor." There were 14,859 entries in the Public Member Family Trees for this ancestor. Incidentally, in the first 100 of these entries, only a very few had even one source. Almost all of the first 100 entries were "unsourced." Despite the proliferation of duplicate entries in family trees, there is very, very little original research. On a website such as Ancestry.com Public Member Trees, there is simply no reason to go through this vast number of returns when it appears that almost all of the results lack sources. There are much better ways to spend my time. The core answer to the entire issue is keeping one master file of all of your genealogical information. I am not particular about which program I use for my master file, arguments can be made to use any of the well-known genealogical database programs available today. As I have mentioned many times in the past, I have several programs on all of my computers. But the key question raised by the commentator was how to keep all of those different versions of the program in sync. As I mention in my first post, I don't even try. I use the online programs primarily to gather sources and make connections with other family members. I use the different database programs on my computers for their individual strengths. Over the years, I have changed my master program several times. I am still not completely decided, but I will probably use FamilySearch.org's Family Tree as my master program if they get the merge issue working sometime in the future. I have been moving all of my sources from all of my individual programs into Family Tree now since FamilySearch added that capability. From time to time, I take down one or more of the online family trees and substitute a newer copy from the master database. This seems to work well for me. In comparing the duplicates between online family trees, MyHeritage.com does a really good job of showing the user the differences between what is on the suggested family tree and comparing the information to what is on your own tree. Their tools for comparing different entries in different family trees are much more complete and powerful than any of the other online websites. In addition, I can synchronize all the data I find on MyHeritage.com to their free local database program, Family Tree Builder. The advantage of focusing on FamilySearch.org's Family Tree program is that promise that it will be a one stop clearing house for possible duplicates. Since it is a unified family tree, theoretically, there cannot be any duplicates. At least, if there are duplicates, there will be a way to merge the duplicates into one unified entry for each individual ancestor. Right now this process involves a pretty heavy degree of manual labor. When I do find new information from one of the online databases, it is time consuming but rather simple to add that new information or source to my master program. Either one of the programs on my computer or FamilySearch Family Tree, whichever I feel like at the time. My personal genealogical main activity for the past few years has been adding in all of the huge number of sources and scanning and organizing even more documents, photos and other items. It is when I make statements such as this, I become apprehensive that most of the genealogists in the world will simply not relate to my challenges. From previous comments I am painfully aware that most people cannot dream of having tens of thousands of researched ancestors with hundreds of thousands of pages of source documentation. So my solution to the issue of duplicates may not work for you with your database. You may have so few entries and copies out there, that you can process all of them for content. Back to a question I raised in the last post. My initial survey of the Family Group Records in the Family History Library left me with a minimum of six verified and sourced generations of ancestors on every single family line with some lines going back 19 generations. I am not presently in a position, absent a workable online program, to make any further inroads into my ancestors. I am waiting for Family Tree and hopefully, I will not have to wait too much longer. I suspect your readers would also be interested. And I suppose one can phrase the question this way: suppose a SmartMatch (or some other matching) indicates to you that your GGF had a hitherto unknown son. What do you do? What's your primary database? Where do you update first? Do you then update all over? Similarly, suppose "hints" and/or "SmartMatches" connects you with new sources that you can attach to events for your GGF. Do you try to grab each (correct) hint in Ancestry and each (correct) SmartMatch-to-a-record? How then do you update on your own computer? The real issue here is whether or not you think it is important to keep all of your various online family trees "up to date?" Granted, if you are active in doing genealogical research, your most recent or master file will continually change. If at any time you upload a copy of that file to an online family tree program, the uploaded file will very quickly become out-of-date. Is that a problem? Suppose I use the example of finding an unknown (to me) child in one of the families online. Do I immediately feel the need to update every other online program? From my perspective, the answer to all of these questions is a qualified no. I do not feel any obligation or compulsion to update all of the different online family tree programs with newly discovered evidence. The reasoning behind my answer is complex and involves some considerations that are not obvious. There are some obvious consideration, such as the time involved in making all the changes, but that is only a background issue. Research Department Patron Files, ca. 1928–1966, and Indexes starting on FHL Film 540714From 1928–1966, the Genealogical Department conducted paid research for Latter-day Saints. These files contain correspondence, documents, pedigree charts, and family group records. This collection includes files as of 1966. They are arranged by the name of the person requesting the research. "Family Group Collections of the Family History Library." This also describes the relationship of the Temple Records Index Bureau Endowment Index, the Ordinance Index, and Ancestral File to the family group records. Note: I have left the links in the quotes. This process took about 15 years or so. What I would do is follow the pedigree lines, one by one, and look for Family Group Records that gave any information about my family lines. I examined thousands upon thousands of Family Group Records. If there was the slightest doubt that the record was correct, I would verify the sources and research the accuracy of the records. That process created my core genealogy. Most of the time, I was comparing multiple Family Group Records for the same families. Often, there were dozens of the duplicates, sometimes into the hundreds. In each case, I tried to reconcile any differences, so I am more than used to looking at duplicate records. Over the years, because I was doing the research as I went along, I have found very few of my own entries need correction. It is very important to this discussion to understand that I found a mountain sized number of duplicate entires. I was extremely familiar with the issue of conflicting claims, incomplete entries, mistakes, fraudulent entries, "back to Adam" and all the currently discussed issues. I have seen them all. As this work progressed, so did the technological advancements. As soon as I bought my first Apple II computer, I began computerizing the information. As soon as the Internet advanced to the point of being able to submit files, I did so. The effect of this early adoption of the technology is that the vast majority of the current online entries dealing with my family are derived from my own early research. How complete was my work? That is a good question. I extended every singe family line until I ran out of documentation. Could the lines be extended today? Yes, probably, but that is another question that will have to wait until I get to it. So, looking at the status of all of the online copies of my family research today, I don't really care all that much about variations. The real issue is whether or not I can find anyone doing primary research that may clarify or extend the information I have already gathered consisting of hundreds of thousands of pages of documentation. If I look at a prospective family tree online today, I can tell in an instant whether or not I need to look further. All I have to do is look at the number of sources. If the line is extensively sourced, I am interested. Otherwise, I could care less because it is very, very likely merely a copy of my earlier work. I also have a few indicator ancestors. These are people whose information I have corrected over the years. If the online file has the "old" incorrect information, I simply disregard the rest of the file as unreliable. OK, so this post is getting rather long. I will continue this analysis in another post as soon as I get some time, either today or later on. I am getting into a rather busy time the next two weeks with presentations and such. Stay tuned. The Gypsy camp suspects, Eleftheria Dimopoulou, 40, and Christos Salis, 39, received more than 2,500 euros ($3,420) in monthly welfare payments after declaring they had 14 children, eight of whom are unaccounted for and presumed not to exist, authorities said. They were jailed on charges of abduction and document fraud. A Supreme Court prosecutor ordered a review of thousands of birth certificates issued after Jan. 1, 2008, amid growing criticism that the country's birth registration system is wide open to abuse. Up until five months ago, there was no central national registry, so births declared in different municipalities were not cross-checked. Who "cross-checks" U.S. birth certificates? Aren't we open to the same type of fraud here in the United States? A careful researcher would not rely on a single document as conclusive evidence of the members of any ancestral family. Food for thought. During the past week, I have spent some very complicated hours dealing with duplicate individuals in various programs online. I have mentioned before that some of my ancestors have literally hundreds of copies of their basic data in dozens of programs on the Web. Some of the online programs, such as MyHeritage.com and Ancestry.com consider these "duplicates" to be an opportunity to share and collaborate with the other contributors who have similar information about the same individual ancestors in their own family trees. But in many cases, the information is similar enough to make a connection but differs from my own data in significant ways. One reaction to this flood of duplicates is to simply ignore it. I must admit that this is what I have done in most cases. Right now, I have huge pool of Smart Matches pending on MyHeritage.com. I have another pool of matches on Ancestry.com. I have notifications on Geni.com that I have over 700 matches and the list of programs with multiple copies of my ancestors goes on and on. It would be interesting and perhaps productive to follow up with all these leads, but there is not time to do this. From another direction, I helped patrons resolve issues with merging duplicates in FamilySearch.org's Family Tree program. Some of these were extremely complicated to resolve and took quite a bit of explanation to the patron, some of whom I am sure did not understand at all what I was trying to resolve. Then there is the problem of duplicates in my own databases on my own programs on my own computer. For example, I have 10 individuals names "Sarah" with no further identification. Are any of these duplicates? I cannot tell because of the lack of specific information. I have eighteen individual ancestors identified only with the name "Mary." One of the Mary entries dates back to 1592. Yes, I am guilty of having the same kind of entries in my genealogy that I use all the time as bad examples. The genealogical database programs all seem to have a provision to merge duplicates. But in almost every program, merging the duplicates does not eliminate all of them. Some duplicates seem to resist merger, even when they are specified and done manually. I realize that this is not a new problem. As I went through the Family Group Records generated by my own family members in the past, I found dozens, if not hundreds, of duplicate records. It makes me envy those who live in a genealogical wilderness where there has been no research and they have an open field to discover and cultivate. My current solution, aside from ignoring all the duplicates, is to focus on my own database and build a strategic base of operations with multiple sources for each individual. Although this is a slow and somewhat tedious process, it promises to resolve the duplicate issues in the end. If there ever is an end, which I doubt. As to the issue of conflicting data, that is the primary reason for the effort to establish a huge base of sources. If my research is sound and supportable, then the multiplicity of conflicting information will have no effect on my own information and I can proceed in extending the documentation as far back as I can go before I pass on to my ultimate reward. I have concluded that this is all I can do. Of course, I would like to connect with those in my family who have a similar goal, but except for my daughter, I have yet to find very many, if any, who share my goal. I received the following comment from a recent post about "The Benefits of the New Online Genealogy Alliances." Where is the benefit of subscribing to a site if the document I need is on a free site? Won't I find it on the free site? Won't I have access to it? Won't the free site search engine find it? 1. Where is the benefit of subscribing to a site if the document I need is on a free site? This question makes several assumptions. The primary assumption is that the user would know that the document was on more than one website. Let's suppose that I had a subscription to a commercial website. Let's further suppose that in working on the website, I found a document I needed for my research. Why would I then go out and look for the same document on a "free" website? My point is that how are you going to know whether a document can be found in multiple locations on the Web once you have found what you are looking for? I suppose that you are subscribing to the commercial website because you have found it to be useful for your research. I guess I would view the question in the context of an analogy to having a product I wanted in a store near my home. If I go into the store, find the product and buy it, am I going to then go home and search around to see if I can get the same product for free? I think the real question here is whether or not having some of the databases or collections on two different websites, some free and some by subscription will cut into the subscriptions paid on the commercial website? I think not. That is the case presently with U.S. Census records and many other records. For example, Ancestry.com has the U.S. Census records from 1790 to 1940 online as part of their subscription service. At the same time, Archive.org has the same records from 1790 to 1930 online for free. Has anyone stopped their subscription to Ancestry.com because those records were available on Archive.org? I seriously doubt it. Does it matter that at least five other websites have a copy of the U.S. Census records? Again, I seriously doubt it. Duplication of the records, free or by subscription, does not seem to cut into the growth of Ancestry.com and I doubt it will affect the other online genealogical subscription services either. 2. Won't I find it on the free site? The answer here is maybe yes and maybe no. My answer would be similar to the one I gave for the first question. But here the issue is taken a little further. Will I look for my record first to see if I can find a free copy before I go to the website I have a subscription to? I think not. If you have a subscription to a website, you will probably go there first. By the way, if you are working with one of the subscription websites, I always suggest doing an online search for any documents you find to see if another website either has more of the same records or something closely related that might apply to your ancestor. 3. Won't I have access to it? I think this question is directed specifically at the issue of the agreements between FamilySearch.org and the other online database companies. The answer is a simple, yes you will have free access to FamilySearch.org's records. 4. Won't the free site search engine find it? This question cannot be answered directly. Each individual genealogical database program online has its own search engine. I have previously written about a comparison between some of them. It is apparent that some search engines are better than others at finding relevant documents. But here the variables are too great to answer the question. It is entirely possible that making a search in a free site might turn up the particular document you are looking for. However, the question seems to presuppose that there is a generous amount of duplication between the various programs. It is true that some large databases are duplicated such as the Social Security Death Index, but each of the larger companies has its own unique set of documents. I hope this answers the questions. I don't see the agreements between the various large genealogy companies as adversely affecting their user base. I assume all will benefit from the agreements. By enabling this feature, FamilySearch is encouraging users to submit copies of documents they may have in their personal collections that act as source material for the user's ancestors in Family Tree. From previous announcements, it is likely that in the near future they will also provide a way for users to link the documents to a specific source reference. I suggest that you carefully read the Documents Agreement that appears when you go to upload a document to FamilySearch.org and the Submission Agreement also. You should be familiar with both these policy statements. I have been trying out this new feature and it seems to work very well. In a recent post, Blogger Tony Proctor asks an almost rhetorical question, "Do Genealogists Really Need a Database?" The post is slightly technical but explains how and why accumulations of information in computer programs work the way they do or don't. I recommend reading this post for a basic understanding of the challenge of keeping large amounts on information in computer files. Currently, one of the challenges of genealogy is that the data files we are creating on our computers include scanned documents and images. In the pre-media days, genealogical data files were almost exclusively text files. If you have been keeping your genealogical data on a computer with a genealogy program such as Personal Ancestral File, you might be aware that the resultant files were very small. What I mean by "small" is that they took up very little memory space. For example, even if your file had tens of thousands of names, you could store that file on two or three or maybe more, floppy disks. Personal Ancestral File had a utility that would break the file down onto separate floppy disks. You might remember that a double-sided, high-density (HD) 3.5 inch floppy disk only held 1.44 MB. That's Megabytes not Gigabytes. A Gigabyte (GB) is 1000 Megabytes (MB). So, a 1 GB flash drive holds almost a 1000 times more information than a 3.5 inch floppy disk. Today, we can commonly buy Terabyte (TB) hard drives or drives holding 1000 times more information than a Gigabyte drive. To put this into context, the size of one of my smaller sized photographs is about 5 or 6 MBs. It would take 5 or 6 floppy disks to hold one JPEG photograph even if that were possible, which it isn't. The rest of the genealogical challenge is that with these huge files sizes we accumulate a lot of diverse types of files; text files, JPEG files, TIFF files, DOC files, PDF files, just to name a very small sample. The programs have to be able to import and view all of those various file types and keep track of their storage locations on our hard drives. If you have been using a genealogical database program for a while, you likely know that keeping track of all that information is a challenge. Right now, we have no way of completely transferring all of the information in our genealogical data files including all of the attached media files (photos, documents etc.) from one program to another. What Tony is talking about, in part, are all the technical issues involved in transferring that data from one computer program to another. There are several reasons why this is desirable. The primary reason is that we do not want to lose data to obsolete programs. If you have your genealogy on 3.5 inch floppy disks in an older program such as Personal Ancestral File (PAF), you many have noticed something. There are no more floppy disk drives around except on very, very old computers. There is a huge challenge in transferring those old files into a format that can be used on a new computer. This is especially true if the the old PAF file was stored on multiple disks. I might also mention that even if the old PAF file was on multiple floppy disks, that file did not have a copy of any attached media files such as photos or documents. Those were not copied when you backed up the file or put it on multiple disks. So, in most cases, the media files have been lost. Today's genealogy programs, for the most part, do not make a copy of the attached media files. So even if we come up with a way to transfer the data from program to program, we will still be faced with the problem of including a way to copy and find the attached media files. All of this takes more and more computer memory, hence back to Tony's discussion. One option that is just now starting to be viable, is to put all your information into an online programs such as FamilySearch.org's Family Tree. But as you probably know if you have been reading this blog, that is an entirely different challenge. All of this discussion is aimed at the issue of preserving our genealogical work for future genealogists. That is the core concept and core goal of these types of discussions. Looking Forward to RootsTech 2014 -- Why RootsTech? I have more than 20 genealogy conferences scheduled during the next year at which I will be speaking and teaching classes. 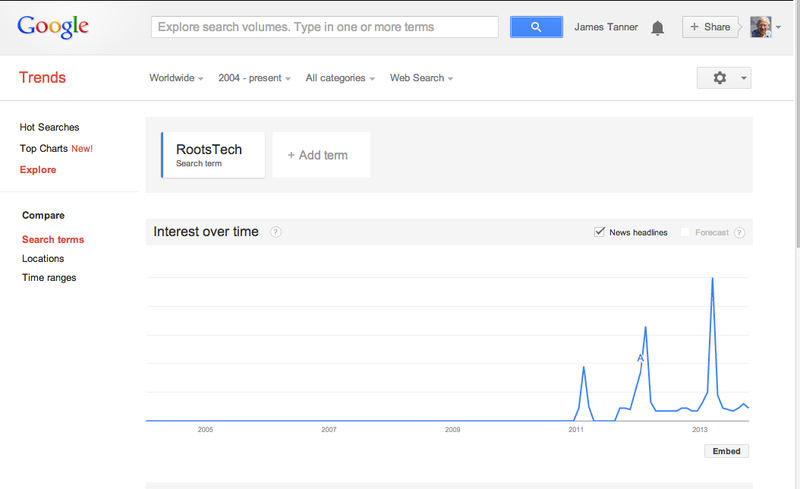 Of all those conferences, RootsTech 2014 has the potential to reach the most people. If you like to teach, one student is sufficient. But if you have a passion, you would like to convey your message to as many people as possible. It was the stated goal of the past RootsTech conference to re-broadcast the upcoming 2014 conference to over 600 locations through out the world in a variety of languages. If that happens and I have no doubt that RootsTech 2014 will come close to or exceed that goal, presenting at this one conference could reach more people than all the other conferences combined. The reason for the expansion of RootsTech 2014 lies in the active participation of all four of the large online genealogical database companies; FamilySearch.org, the sponsor of the Conference and the other three, D.C. Thompson (findmypast.com), MyHeritage.com and Ancestry.com. It is not just the participation of these four companies that is important, it is also important that the Conference brings together diverse communities that approach genealogy from very different perspectives. The dynamics of our economy make it impractical for the vendors in the genealogical community to go to smaller conferences. The cost of travel, lodging and transporting their sales materials, has to be covered by either the advertising advantage of having a certain number of people or covered by actual sales at a conference. Over the past couple of years, we have seen fewer and fewer of the larger vendors attending local or smaller genealogy conferences due to these economic constraints. One advantage of a large conference, such as RootsTech, is the guarantee that there will be large enough numbers to pay the overhead expenses of attending for either reason. The same economies of scale apply to the presenters and other participants. If you have enough people present or the opportunity to talk to large numbers through re-broadcasts, then there is a greater attraction. In addition, the genealogical community needs to attract a new, younger group of participants. RootsTech is taking the opportunity of having a large attendance to provide activities that they hope will attract these younger participants and with a special track of classes aimed at beginners, they also hope to attract new potential genealogists of all ages. At smaller conferences, the classes cannot cover the depth of having dozens of different presenters on an advanced track at the same time as delivering multiple classes for beginners. So, there are a lot of reasons why a large genealogy conference makes sense. Personally, one big advantage is that many of the people in the diverse genealogical community attend and I get to see and meet them in person. That is a very big plus. It is a fact that all software has a finite and relatively short life cycle. If you would like a glimpse into the time frames involved, look at the Microsoft "Windows lifecycle fact sheet." Without reproducing the whole document, you might note that mainstream support for Windows XP was discontinued back in April, 2009. Windows 8 is already scheduled for its end of support on 9 January 2018. When asked "What should I do when the version of Windows I'm using reaches its end of support date?" Microsoft responds: "You can either install the latest available service pack or upgrade to a newer version of Windows." One outside factor that drives these changes is the availability of newer technology. For example, the discontinuance of Windows XP roughly corresponds to the introduction of the Intel® Core™2 Duo processor T9800 chip. In late 2005 and early 2010, the Intel i5 and i7 chips were also introduced. So there was a significant advancement in chip technology about the same time Microsoft came out with a newer version of Windows and discontinued support for previous versions. There is almost a one-to-one correlation between upgrades in hardware and changes in the software. This is a process that will continue long into the future. Genealogy software, both local computer based and online, is not at all immune to these constant changes. You may lament the fact that your current computer will not run the newest software, but ultimately that will be the case with any computer presently in use. In addition, reliance on faster and faster Internet connection speeds is also a certainty. Dial-up access has been marginalized by the online software developments. This fact is not a conspiracy by any of the large genealogical database companies, they are victims of the situation not the perpetrators. This need for constant upgrading is one reason I have been consistently urging people to migrate their data to newer systems from time to time and abandon old, no longer supported, software such as Personal Ancestral File. You can complain, rail against the system or opt out, but technology has a life of its own and will just keep changing and forcing older technologies out of the market. I have been living with this situation for a very long time and I am already facing the possibility that I will have to upgrade my laptop before too long. I may have a couple of more years of life in my desktop computers, but when I bought them, I realized their days were numbered. Does Genealogy Win Any Popularity Contests? Happy Day! My Family History is Done. Don't bother me -- I already know everything! What are the risks associated with genealogy? Does Time Matter? What do know about it? Changes in my data online? Will eBooks Replace Paper Books? Can we overcome the Great Genealogical Divide? How secure is the Internet and cloud storage? Ancestry.com LLC Acquires Find A Grave, Inc.